We are proud to welcome a new member organisation to the CML Advocates Network: Pacientes LMC based in Spain. The CML Advocates Network now totals at 113 member organisations in 84 countries worldwide! See the list of CML groups in the Network on our world map. 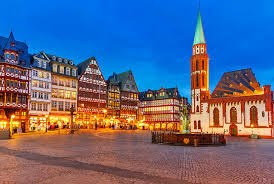 At the annual ASH congress, the iCMLf, in collaboration with The Max Foundation, holds its annual "iCMLf Forum for Physicians from Emerging Regions". Presenters give the local emerging regions perspectives on each topic, followed by iCMLf experts from western countries and a discussion with the audience. The Forum was opened with a keynote from Dr. Brian Druker on meeting the new challenges in CML therapy. Then, Professor Tapan Saikia from India and Professor Andreas Hochhaus from Germany covered the challenges of CML frontline therapy. Afterwards Dr Anthony Oyekunle from Botswana and Dr Delphine Réa from France covered the issue of comorbidities when managing CML. The webstreams are now available. The Innovative Medicines Initiative (IMI) has approved HARMONY, a 5-year project that aims to foster better access and care for patients with various hematologic malignancies (HM) with the use of big data. The project is made up of 51 partners from 11 European countries, including 7 pharmaceutical companies. We are very excited that CML Advocates Network will be contributing to this unique project. Jan Geissler is the Work Package leader that will be coordinating HARMONY's Stakeholder Forum and patient input of the haematology patient community into this project. The project will kick-off on 16 January 2017 in Salamanca, Spain. Registration process will start the 2nd week of January 2017 and will inform you as soon as the registration platform is online. Tyrosine kinase inhibitors (TKI) have dramatically improved survival of CML and made it a chronic disease. However, life-long therapy is still advised according to expert recommendations and the product labels of current TKI treatments. 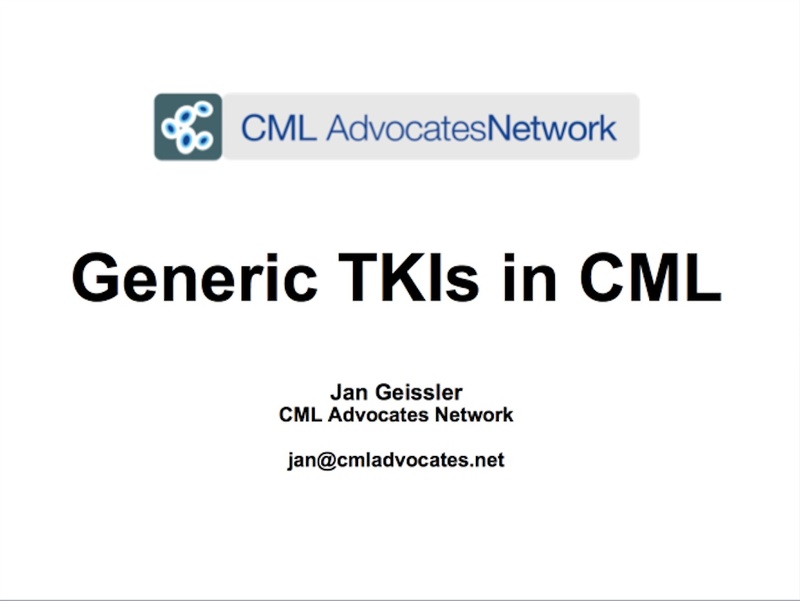 Depending on the choice of TKI, about 40-70% of CML patients reach a deep molecular response, meaning a BCR-ABL ratio of 0.01% (MR4) or below. Given it had been observed that some patients were able to stop treatment in deep remission without a recurrence of the disease, the effectiveness of stopping TKI treatment of CML patients at large having a sustained, deep molecular response is a key question that is being investigated in various studies, and is probably the most debated CML topic at this year’s ASH. We are summarizing the most important presentations, discussions and posters on that important topic at the ASH congress this year. We are proud to welcome a new member organisation to the CML Advocates Network: CML Palestine based in Palestine. The CML Advocates Network now totals at 110 member organisations in 83 countries worldwide! See the list of CML groups in the Network on our world map. One day, one community, one life changing reality… Today we unite to take World CML Day global! Today we are together to take a stand, share our needs and raise awareness! Today and all week long in September organizations around the globe are celebrating World CML Day through their activities, by sharing their achievements over the past year and by pointing out the problems they are still facing. 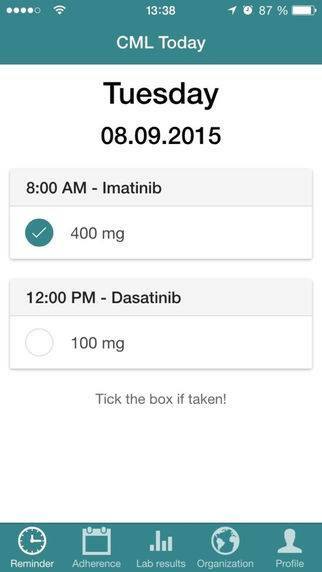 CML ADHERENCE APP “CML Today” is celebrating its 1st birthday! 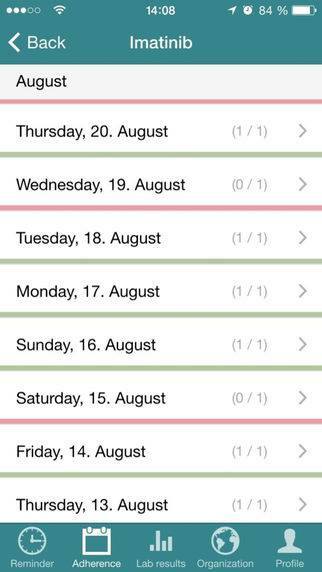 “CML Today” is an app that has been developed to support adherence to TKIs as well as to track patients` PCR results. The mobile app is now available in 7 languages: English, German, French, Spanish, Portuguese, Hebrew and Arabic with more languages to follow. 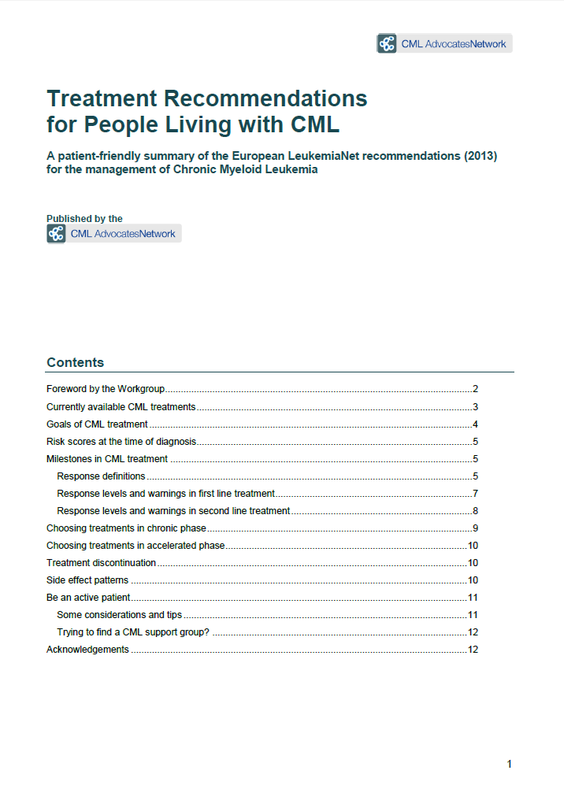 You can download „CML Today“ free-of-charge from the Apple App Store (iphone) and in the Google PlayStore (Android). Please talk about “CML Today” and encourage CML patients to use “CML Today”! Please also check out the activities that are taking place all over the world on World CML Day 2016 and the campaign materials developed by members of the CML Advocates Network - and do not forget to share your activities with us and other groups! Last but not least, don´t miss our Facebook-page! More information on World CML Day 2016 can be found here. The CML Advocates Network wishes everybody an inspiring and successful World CML Day 2016! ... is the motto for this year´s World CML Day campaign, which will take place tomorrow, Thursday Sept 22! In order to help you spread the message of awareness and strengthen your voice, the CML Advocates Network has developed a World CML Day toolkit to make this day global and unique. The toolkit includes adaptable artwork for print and online use (posters & flyers), a photo database and a press release. Check out our members´ campaign materials and also don´t miss our Facebook-page. Please share photos and activities of your World CML day with us by e-mailing to , so we can add them to our list of worldwide activities and to our photo gallery. OPTIC, a study to determine the efficacy and safety of ponatinib in patients with resistant CML in chronic phase. This study is including patients in 19 countries on five continents. ENESTPath Patient’s Voice Italian Substudy. This study is exploring the emotional experience of patients participating in the ENESTPath study with nilotinib. The substudy is available only in Italy. Eleven studies are ongoing but no longer recruiting new patients. These studies have been moved to the category "Trials that are no longer recruiting".Two trials have been completed or terminated: Spirit 3 and NordDutchCML006. They are no longer ongoing and therefore not any more listed on the database. We would like to thank everyone for sharing information with us on new studies or changes in ongoing studies. Your invaluable input helps us keep the registry up to date. Thank you. Do you know of any study that is not yet listed in our Clinical Trial Database? Please let us know by filling out this form. Or is there an entry which should be corrected? If so, please send us an email. Please also visit our discussion forum if you have any questions or wish to share your experience on these studies! We would like to thank Leny Caban from the Romanian organization „Asociatia Pacientilor cu Neoplazii Mieloproliferative - MIELOPRO” and Jana Pelouchova from the Czech organization „Diagnóza leukemie” for making our patient-friendly summary available to even more readers. Thank you very much, Leny and Jana, for dedicating your time and efforts to co-ordinating and performing the translation and review of the documents. If your organization would like to arrange translation of the summary into your local language, please contact Jan, Giora, Nicole or Marion for advice at .